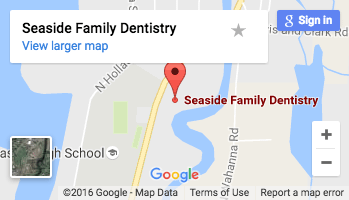 For many people, it’s easy to think they have no reason to visit a Seaside family dentist. Because they don’t feel any tooth pain they incorrectly assume they enjoy perfect oral health. Unfortunately, when it comes to your oral health, pain and discomfort only develop once a problem has become a serious concern. To protect your oral health, you need to schedule regular exams with a Seaside family dentist who can properly assess the current state of your oral health by spotting any signs of decay or disease. If you have avoided the dentist because you enjoy quality oral health, here are a few reasons why you should consider receiving dental care in the near future. If you didn’t wear braces as a child, it’s easy to assume your oral health will always remain how it is, regardless of the current state of your smile. If you suffer from teeth that are crooked, misaligned, or crowded, your long-term oral health is at a significant disadvantage. When your teeth are not evenly spaced, it makes it difficult to properly clean the surface of your teeth enough to remove harmful oral bacteria that causes decay and gum disease. A straighter smile can not only improve the look and how you feel about your appearance, it can also dramatically improve your oral health as well. In case you feel self-conscious about the idea of wearing braces as an adult, know that the number of adults with braces continues to rise every year. What was once commonly thought of as only for kids has quickly become one of the most common cosmetic dental procedures for adults in the world. Even if you practice outstanding oral hygiene and never fail to brush and floss daily, you still need to receive regular oral cleanings to remove any hardened plaque deposits. Plaque – a sticky biofilm – ranks as one of the biggest threats your oral health can face. When not removed properly from the surface of your teeth, plaque can build up and transform into tartar, a yellowish substance that stains teeth and contributes to gum inflammation, the root cause of gum disease. A cleaning from our gentle dental hygienists at Seaside Family Dentistry can remove plaque deposits from your teeth, keeping them healthy and looking their best. In recent years, a growing amount of research has found compelling links between gum disease and a range of chronic health problems that include heart disease, stroke, diabetes, dementia, arthritis, and cancer. To lower your risk of gum disease, it’s vital that you receive regular dental exams from your Seaside family dentist. Regular exams provide Dr. Santos with the opportunity to spot the signs of the disease early on while still easily treatable. What begins as tender gums that bleed after brushing can quickly become a far more serious problem that could not only threaten permanent tooth loss, but damage to your overall health as well.